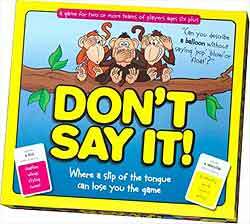 The game where a slip of the tongue can cost you dearly! Can you describe a balloon without using the words ‘pop’, ‘inflate’, ‘bang’ or ‘float’? With many different levels of difficulty, this is great fun for kids of all ages.